A huge thunderstorm struck Shanghai on September 13, this year. Within hours sixty roads were flooded. Lujiazui in Pudong was worst affected, with tens of thousands of people unable to cross the Huangpu River. Roads were paralysed, and the No. 2 subway line, which links the two sides of the river, was suspended due to water entry. Many had to wait until late that night to get home, with some opting to stay in hotels. Suddenly everyone realised how reliant they were on underground and light rail. Construction started on China’s first subway in Beijing in 1965. Now sixteen mainland cities have urban rail systems, with a total length of 2,037 kilometres. Plans approved by the National Development and Reform Commission will see a further 1,000 kilometres of urban rail networks built in another 20 cities. City planners are turning to urban rail for many reasons, one of which is that roads are becoming unbearably congested. When Shanghai started building its first subway line, in the early 1990s, the city had a permanent population of 13 million and about 200,000 cars. As the city became an economic powerhouse the population reached almost 24 million, with 2.8 million cars. Early this year Shanghai’s transportation authorities estimated that the average speed of cars on city-centre expressways at rush hour had dropped to 36 km/h. Unsurprisingly, these high levels of exhaust fumes leads to severe air pollution in many cities. Urban rail is a part of the solution. 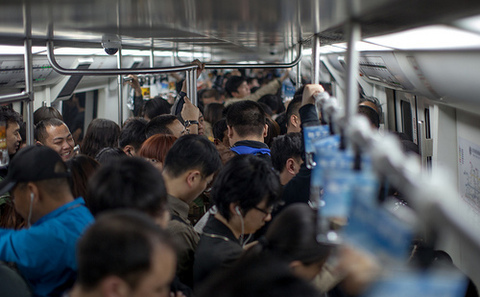 Mao Baohua, Dean of the School of Traffic and Transportation at Beijing Jiaotong University points out that although subway systems don’t make a profit, they are needed to relieve congestion and cut pollution. Globally, rail systems are the backbone of urban transportation – they provide fast, high-capacity, safe and punctual transportation, with good environmental performance and energy-efficiency. However, there are downsides, for example vibrations that affect existing homes, as well as noise and electromagnetic pollution. Environmental problems with many urban rail projects can be traced back to weak environmental assessment procedures. In 2008 some Shanghai residents’ scepticism about the environmental impact assessment carried out for a proposed maglev (magnetic levitation train) line led to plans being frozen. Chinese law specifies two compulsory environmental assessment processes for any proposed urban rail projects. The first is the completion of a plan for the urban rail network and also for near-term construction. The second is the compilation of both environmental impact assessment and project feasibility studies, in which the environmental impact is predicted and analysed, and the presentation of measures to mitigate this – such as noise baffles, cushioning to prevent vibrations, environmental-protection measures to be taken during construction, etc. Construction can only start once an environmental impact assessment has been approved. In the past the environmental authorities have not had much say – many project operators would not wait for approvals before going ahead. Rail operators have often found themselves having to deal with engineering and environmental problems caused by errors during the planning and construction phases. Officials have attempted to crackdown on these problems. In May 2011, the Ministry of Environmental Protection temporarily called a halt to a subway project in Wuxi because it had started without its permission.